Actual technologies for digitizing, restoring, preserving and archiving time-based media, “old” and digitally born. Multimedia contents must be analyzed separating the sources (audio, video, still images, text) and combining in a more semantic way the low and high level analysis of each type of content, provides a more automatic method to manage and retrieve contents. Knowledge and application of different standards for the transmission of audiovisual information and multimedia, valid for multiple platforms and devices. Metadata, tagging/ Methods and technologies. Tools for digital content management during the whole life-cycle, from the creation to the publishing and dissemination. These systems will include data acquisition and storage systems, and rights management systems. Interface. Advanced techniques of interaction and graphical interface, including aspects of accessibility, usability, graphical representation, interaction modes and different platforms. How do designers structure complex data? Where do we find the information that we are looking for? What is the most effective way nowadays to communicate a work of art? Application of the Semantic Web technologies to the information processing and knowledge management, focused on graphic environments of knowledge transmission. New ways of generating, managing and using user-generated contents, analyzing emerging applications such as syndication portals or semantic annotation. Serving as an intermediary between the artist and the public, ARGOS strives to be a place for meeting, dialogue, and exchange. 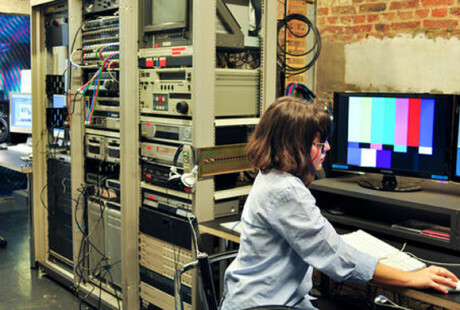 Its functions include production, conservation and archiving, as well as presentation – exhibitions, film and video showings, lectures and performances; additionally, ARGOS houses a public media library and provides a service for the international distribution of artists’ films, videos and multimedia installations. ARGOS has a renowned audiovisual collection, containing over 3.500 titles, namely videos, more than 3.800 specialized publications and an extensive magazine collection in the media library. A part of ARGOS’ mission is to further disclose these collections and make them accessible to the public. Individuals and groups are eligible to participate. We welcome volunteers, interns or free-lancers and developers. However in order to get settled in more into the subject matter and into Argos, we prefer participants for a longer period of time, but the exact duration is discussible. * work closely with innovative international and local artists. * experience and witness different approaches to creative use of technology in video archiving and presentation. * learn how to document and publish multimedia projects using online platforms. * experience Argos from the inside and interact with visiting artists. The intern/volunteer/developer will conduct interviews with the artists and technicians, document the progress of the project, select and edit the material and present this in a multi-media format. The documentation will be initially done in English and will be available online and published on ARGOS LABS website for media art professionals and enthusiasts: for artists, developers, technicians, curators, researchers, lecturers, students and for anyone who is generally interested in media art. This is not a full time job. You will have a lot of freedom to determine your own work hours. Together, we will agree on reasonable deadlines for specific documentation projects. We are looking for fast prototyping and scalability of methods, innovativity of the proposals, their presentability and creativity by looking at their cultural, social or artistic relevance. We propose close cooperation with end user and validation in practice. They are socially or culturally relevant. The projects do not need to be high-tech themselves, but should be developed with or made possible by digital media or other recent technology. The prize will be awarded on a annual basis and is endowed with a compensation. Depending on his/her knowledge, interests and background, a combination of different project is possible. Please respond by sending an email with resumé, motivation and/or research project description to ARGOS.